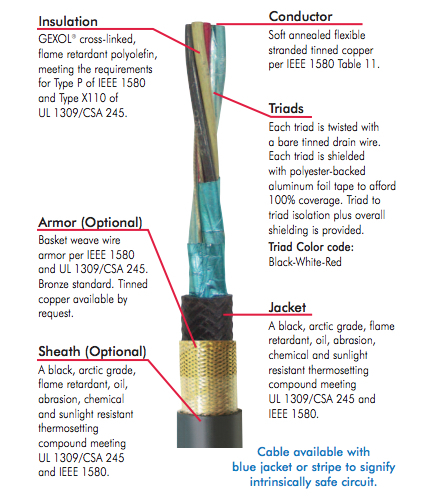 Gexol® Insulated Oil & Gas Cables are the industry’s standard for premium power, control and instrumentation performance. Gexol cables prove their value daily in the punishing operating environments of offshore drilling and petroleum facilities around the world. Offshore applications challenge cable construction with relentless heat, vibration, salt corrosion, drilling mud and mechanical stress. And reliability is a huge issue – because it’s a long, long way to the nearest cable warehouse. You can depend on Gexol Insulated Oil & Gas cables for safe, reliable performance in the harshest operating conditions. Gexol’s lower dielectric constant and higher insulation resistance reduces electrical losses. Gexol’s excellent resistance to moisture produces stable electrical properties throughout the life of the cable. In a fire condition, Gexol’s nonchlorinated flame retardant system produces less toxic and less corrosive gases. Highest ampacity ratings: ABS 100 ̊C, DNV 95 ̊C, LRS 95 ̊C, Transport Canada 95 ̊C. Severe cold durability: exceeds CSA cold bend/cold impact (-40 ̊C/-35 ̊C). Suitable for use in Class I, Division 1, and Zone 1 environments (armored and sheathed).